Human productivity varies wildly and each person needs some method to store the surplus from his periods of high productivity for use during periods of low productivity. Gold can be used for storing that surplus or wealth over long periods. Gold is also a highly sought after commodity with stable price, and its owner can be sure that his surplus/wealth will not disappear overnight. However gold is not a good investment as any interest earned by lending gold bars is really small (no more than 1%). Only jewellers borrow gold bars. They want to avoid resupplying their stock at New Years and wedding seasons. 1. Gold is in constant demand. 1a. Jewellery industry and hand-craft jewellers needs it. This is due to its lustre, malleability and corrosion resistance properties. 1b. Micro electronic industry needs it to make electrically high conductance terminals and connections. 1c. Micro engineering industry needs it to prevent rust and corrosion of their mechanical components. 1d. Electronic, optical, aviation and building industries need it to make transparent metallic films. 1e. Dentistry also needs it for dental works. 1f. Surgical medicine needs it for non-allergic implants. 2. Gold is a suitable bartering medium. 2a. Gold is in constant demand. 2b. If unsold, its owner can gradually turn it into home made jewelleries and sell to his neighbours. 2c. The cost of extracting gold from the ground is remarkably unchanged over thousands of years. Advances in technology is exactly offset by scarcity. Now people have to go 3km deep below the ground to mine gold in South Africa and in Canada (). Soon they may go 4km deep below ground surface to mine gold. 2d. It is corrosion resistant and does not degrade with time. 2e. Any small, light amount of gold still has a high value. 2f. Any common amount of gold can be easily subdivided. 2g. The gold content of any unprocessed gold can be economically assayed and extracted using only HNO3, HCl and Cu. The extraction process is based on a simple metal displacement reaction of Au ions in aqua regia and is a common excercise for gold jewelers. So gold satisfies all the requirements for being a bartering medium. 3. Gold price is not over-inflated. The long term average of gold price reflects its utility value. The price is not over-inflated due to massive amount in storage by various Government Central Banks in the World. They would grab any opportunity to sell their overpriced stocks. The Bank of England (wrongly?) set its selling price at US$268/troy oz in its massive unloading of 200tons of gold in the period of 1999-2002. If gold price was held up by the vicious cycle of greed-herd mentality, the cycle would have been broken up by the prolonged heavy attack by the sale from Bank of England. Despite such tremendous attack on its price by Bank of England, gold price did not collapse like the price of tulips or real estates when their bubbles bursted. Right after the end of its massive sale, gold price rose up to US$600/troy oz, then to the current price of US$1000+/troy oz. The sustainable price is explained by the difficulty in extracting gold from the ground (see also ; I had invested in gold miners during the low price period of 1990-2000 and had experienced at first hand the details claimed by its author). So, contrary to claims (propaganda?) by some authors, the average price of gold is neither pushed up by any remnant of prehistoric tribal memory nor pushed up by greed, fear and herd mentality (A lie told once remains a lie but a lie told a thousand times becomes the truth .). 4. Using and buying gold. Figure: Vietnamese gold slabs for trading. This standardized slab has 37.5g of 99.99% pure gold and has been issued in individual, clear, sealed plastic bubble. Its SJC trade mark is vigorously defended by the Vietnamese government. The last 4 digits of the serial number DB 1XXXX on this slab have been blurred to protect the privacy of the owner of the slab. 4a. When gold possession is legal, people can use any suitable amount they like. They still have to stick to unprocessed gold from reputable producers. The Vietnamese government owns the Vietnamese company SJC which issues and trade gold slabs with weghts of 0.05, 0.1, 0.2, 0.5, 1 Vietnamese ounces. The trade mark SJC is vigourously defended by Vietnamese government. The photos of one such Vietnamese 1 once (37.5g) slab are shown here in this section. SJC company sells people these gold slabs and also buy back from them. 4b. When possession of unprocessed gold is prohibited, people still can use gold rings made by reputable jewellers in weights of 0.1, 0.2, 0.3 troy ounces as their medium of exchange. 5. The costs of owning gold. This varies a lot from country to country and even gold seller to gold seller. It can be anywhere between 0.6% and 2.5% for a complete cycle of buying and immediate reselling. 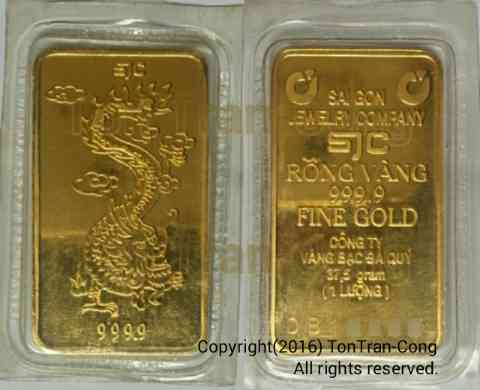 In Vietnam, the cost for buying and then immediately reselling gold slabs (such as the one pictured in this blog) is about 0.55%. This compares well with the foreign exchange cost of 0.2% for buying USD then immediately reselling it. On the other hand, the Vietnamese VND inflation rate has been designed to be 7% (= 4% against USD + 3% by USD),. Only after 1 monrhs the person who bought gold has already been ahead. 6. Storing wealth using gold. Example: You want to buy a $80000 house and each year you can only save up $20000. So you are $20998 short of your target! = $10000*((1.03)^8-1)/((1.03)-1) = $10000*8.89233 = $88,923. In this case you are only $100998 – $88923 = $12075 short of your target! So gold is much better than cash (fiat money) for storing wealth. You are still short of target since the actual value of your new cash saving reduces every year. Gold is much better than cash even in any medium term (abour 3 years duration) financial plan. You can also see why many governments want to outlaw the possession of unprocessed gold: Their fiat currencies are inferior to gold. Please note that this author is neither associated with gold industry nor having any interest/betting on gold price movement. The author has no interest in any gold price betting, has neither relation with SJC of Vietnam, nor with any organization working on gold.
. https://peoplestrusttoronto.wordpress.com/2017/05/12/the-traitors-abetting-the-deep-states-dirty-dying-war-on-gold/, accessed and added to the list on 13May2017. ← The Parasites of Western Economy, Part 1: Motorvehicle Insurance Scammers. how you’re now not really a lot more neatly-preferred than you might be right now. Girl gaga! Your individual stuffs great. At all times deal with it up! Its like you read my mind! You seem to know so much about this, such as you wrote the e-book in it or something. I believe that you just could do with some to power the message home a bit, however instead of that, that is magnificent blog. A great read. I’ll certainly be back. Excellent post. I was checking constantly this blog and I’m impressed! Extremely helpful information specially the last part 🙂 I care for such information a lot. I was looking for this certain info for a long time. Thank you and good luck. My wife and i felt so lucky that Albert managed to round up his research by way of the precious recommendations he acquired from your own blog. It’s not at all simplistic to simply be handing out key points which many people might have been trying to sell. Therefore we understand we need you to be grateful to because of that. Those explanations you made, the easy blog menu, the friendships you aid to engender – it is many exceptional, and it is helping our son and us know that that subject matter is cool, and that is seriously indispensable. Many thanks for the whole lot! basic things, The website taste is perfect, the articles is truly great : D.
Can I simply say what a relief to discover somebody who really understands what they’re talking about online. A Google search for GOLD MONEY would give you many leads. Nice post! Just a couple of comments. 1. A typo – in 2g, I think you mean assay (not essay). 2. In 6, the math as shown says that you’re short of your target wealth accumulation using Gold, but that’s only because you’ve shortened the time frame from 4 to 3 1/2 years. If you tack on the remaining 6 months worth of saving, then in your example, you should be just about dead on the amount you needed to buy the house. 1. I had corrected the word essay to assay. 2. I have also corrected the shortage of saving. Thank you very much for pointing out my errors.